Before Christmas 2016, Richard D phoned me to arrange a day of Private Tuition in Patchwork and Quilting for his wife, Lisa. I give Private Tuition workshops in Patchwork and Quilting at Coed y Berclas but it was a secret until Christmas Day. Lisa told me how very excited she was to open her card and read about her perfect Christmas present. Private tuition allows me to arrange specially tailored one or two day courses in Patchwork and Quilting. You can read more about Private Tuition here. Richard and I had agreed on 1 May for Lisa’s lesson. 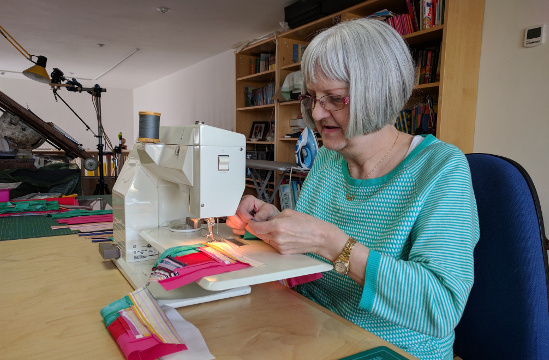 As I was already teaching Free Machine Quilting on Sunday 30th April, Lisa joined the group for that workshop and learned exciting new skills she had not expected. On 1 May, Richard brought Lisa for her Private Tuition Christmas present. Some things are worth waiting for! She spent the day with me making Log Cabin blocks. This taught her accurate use of a rotary cutter, mat and ruler. We also concentrated on careful and accurate piecing. From control of the basics of Patchwork piecing, Lisa will be able to tackle any block she chooses. I thoroughly enjoyed working with Lisa – we had a lovely day together. I know how much Lisa learned over the day and so does she. Lisa, you are a lovely person, you worked hard and visibly improved over our day together. 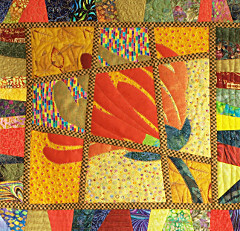 Keep up the Patchwork and Quilting. You’re good. Richard, thank you from both of us, for choosing the perfect Christmas present, a day of Private Tuition in Patchwork and Quilting at Coed y Berclas. This entry was posted in Blog and tagged patchwork and Quilting, Perfect Christmas Present, Private Tuition on 8 May, 2017 by admin.